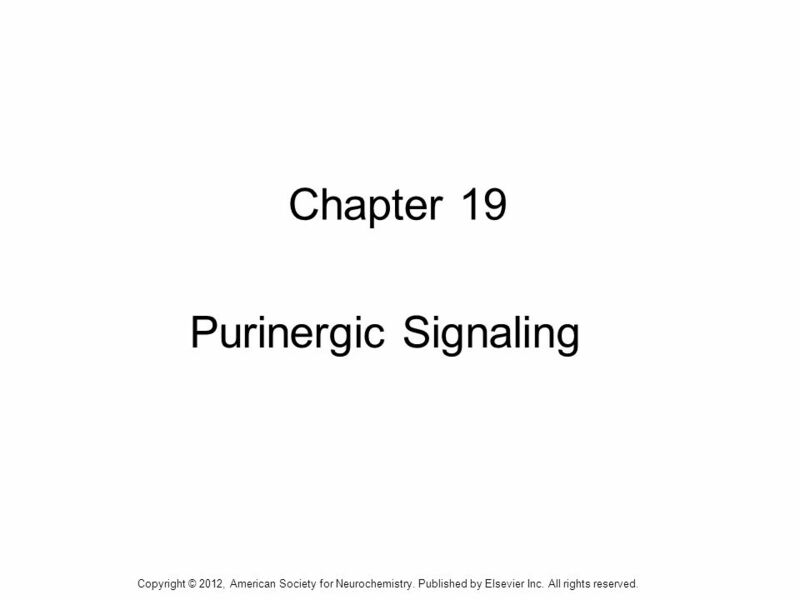 1 1 Chapter 19 Purinergic Signaling Copyright © 2012, American Society for Neurochemistry. Published by Elsevier Inc. All rights reserved. 2 2 FIGURE 19-1: Adenosine 5-triphosphate. Adenosine is a purine nucleoside consisting of adenine and ribose. The addition of triphosphate generates ATP. Copyright © 2012, American Society for Neurochemistry. Published by Elsevier Inc. All rights reserved. 3 3 FIGURE 19-2: Purine release and metabolism. Although ATP is used as an energy source, it is also released as a signaling molecule. ATP is packaged into vesicles by vesicular nucleotide transporter (VNUT), which provides an exocytotic release pathway. ATP can also be released by channels and transporters. In the extracellular space ATP is rapidly hydrolyzed to adenosine by ectoenzymes. Purines have actions through P 1, P 2X and P 2Y receptors. 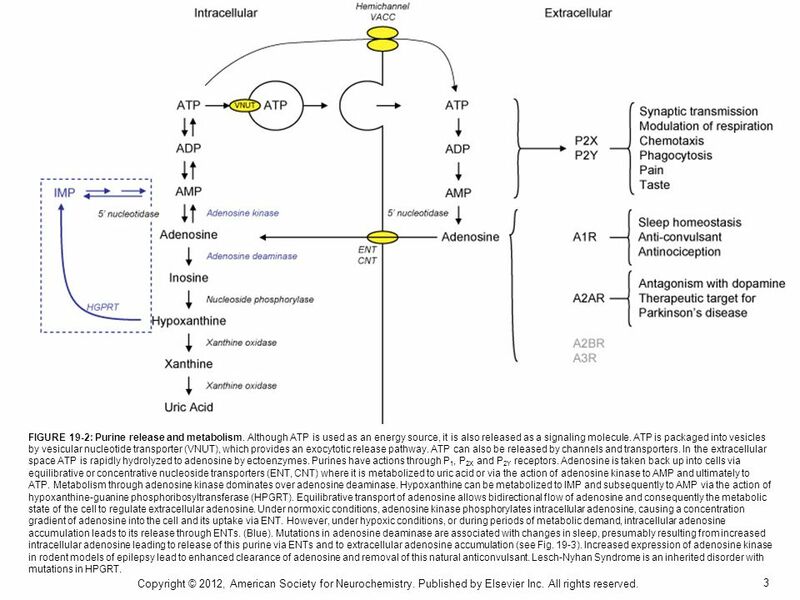 Adenosine is taken back up into cells via equilibrative or concentrative nucleoside transporters (ENT, CNT) where it is metabolized to uric acid or via the action of adenosine kinase to AMP and ultimately to ATP. Metabolism through adenosine kinase dominates over adenosine deaminase. Hypoxanthine can be metabolized to IMP and subsequently to AMP via the action of hypoxanthine-guanine phosphoribosyltransferase (HPGRT). Equilibrative transport of adenosine allows bidirectional flow of adenosine and consequently the metabolic state of the cell to regulate extracellular adenosine. 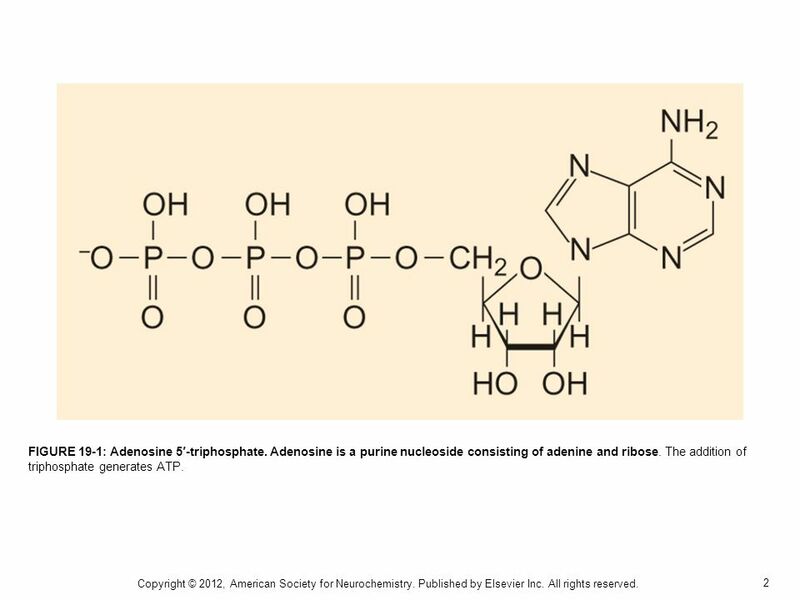 Under normoxic conditions, adenosine kinase phosphorylates intracellular adenosine, causing a concentration gradient of adenosine into the cell and its uptake via ENT. However, under hypoxic conditions, or during periods of metabolic demand, intracellular adenosine accumulation leads to its release through ENTs. (Blue). 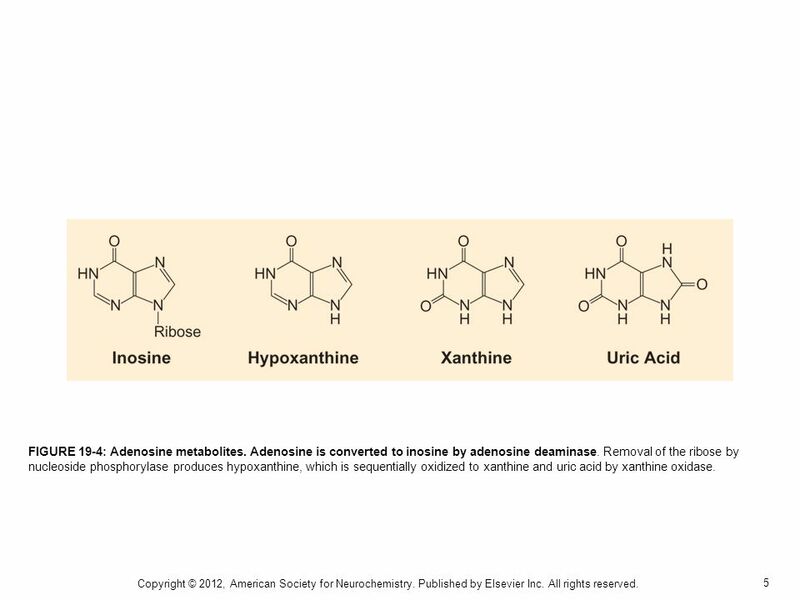 Mutations in adenosine deaminase are associated with changes in sleep, presumably resulting from increased intracellular adenosine leading to release of this purine via ENTs and to extracellular adenosine accumulation (see Fig. 19-3). Increased expression of adenosine kinase in rodent models of epilepsy lead to enhanced clearance of adenosine and removal of this natural anticonvulsant. Lesch-Nyhan Syndrome is an inherited disorder with mutations in HPGRT. Copyright © 2012, American Society for Neurochemistry. Published by Elsevier Inc. All rights reserved. 4 4 FIGURE 19-3: Equilibrative transporters (ENT) allow bi-directional transport of adenosine. (A) Intracellular adenosine is normally phosphorylated to AMP or converted to inosine. This resulting reduction in intracellular adenosine causes an inward concentration gradient promoting uptake of adenosine. (B) Mutations in adenosine deaminase (ADA) or inhibition of either ADA or adenosine kinase lead to reduced metabolism of adenosine causing an accumulation of intracellular adenosine. The elevated level of adenosine reverses the concentration gradient, resulting in a net efflux of adenosine. 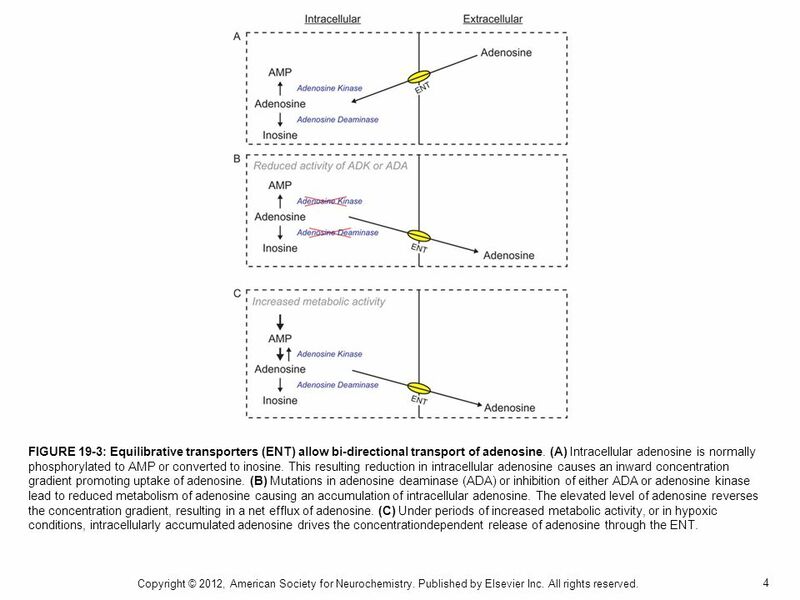 (C) Under periods of increased metabolic activity, or in hypoxic conditions, intracellularly accumulated adenosine drives the concentrationdependent release of adenosine through the ENT. Copyright © 2012, American Society for Neurochemistry. Published by Elsevier Inc. All rights reserved. 5 5 FIGURE 19-4: Adenosine metabolites. Adenosine is converted to inosine by adenosine deaminase. Removal of the ribose by nucleoside phosphorylase produces hypoxanthine, which is sequentially oxidized to xanthine and uric acid by xanthine oxidase. Copyright © 2012, American Society for Neurochemistry. Published by Elsevier Inc. All rights reserved. 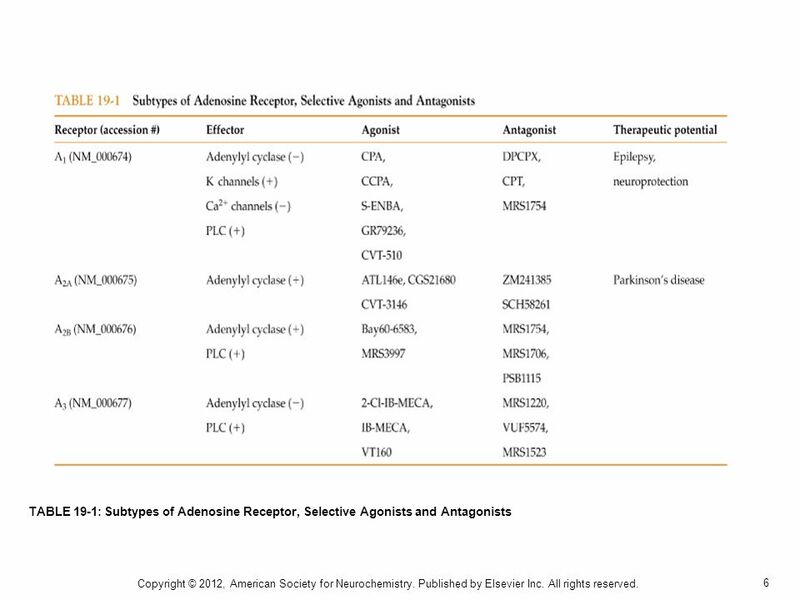 6 6 TABLE 19-1: Subtypes of Adenosine Receptor, Selective Agonists and Antagonists Copyright © 2012, American Society for Neurochemistry. Published by Elsevier Inc. All rights reserved. 7 7 FIGURE 19-5: The purinergic receptor family. The purinergic receptors are divided into two major families, the P1 (or adenosine receptors) and P2 receptors, which principally bind ATP, ADP, UTP or UDP. The P2Y14 receptor binds UTP sugars. P1 and P2Y receptors are coupled to GTP-binding proteins. P2X subunits form trimeric ligand-gated ion channels. Copyright © 2012, American Society for Neurochemistry. Published by Elsevier Inc. All rights reserved. 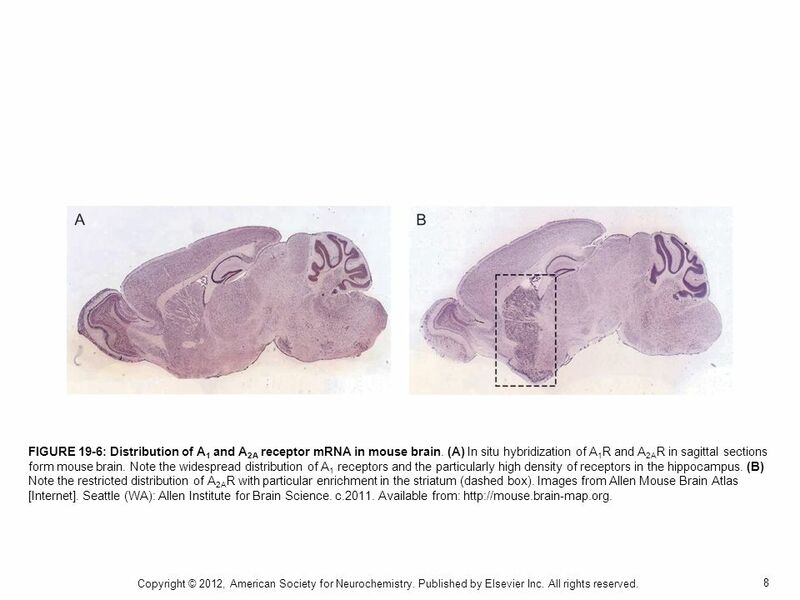 8 8 FIGURE 19-6: Distribution of A 1 and A 2A receptor mRNA in mouse brain. (A) In situ hybridization of A 1 R and A 2A R in sagittal sections form mouse brain. Note the widespread distribution of A 1 receptors and the particularly high density of receptors in the hippocampus. (B) Note the restricted distribution of A 2A R with particular enrichment in the striatum (dashed box). Images from Allen Mouse Brain Atlas [Internet]. Seattle (WA): Allen Institute for Brain Science. c.2011. Available from: http://mouse.brain-map.org. Copyright © 2012, American Society for Neurochemistry. Published by Elsevier Inc. All rights reserved. 9 9 FIGURE 19-7: Cell damage activates microglia. In vivo two-photon microscopy of GFP-labeled microglia was performed. 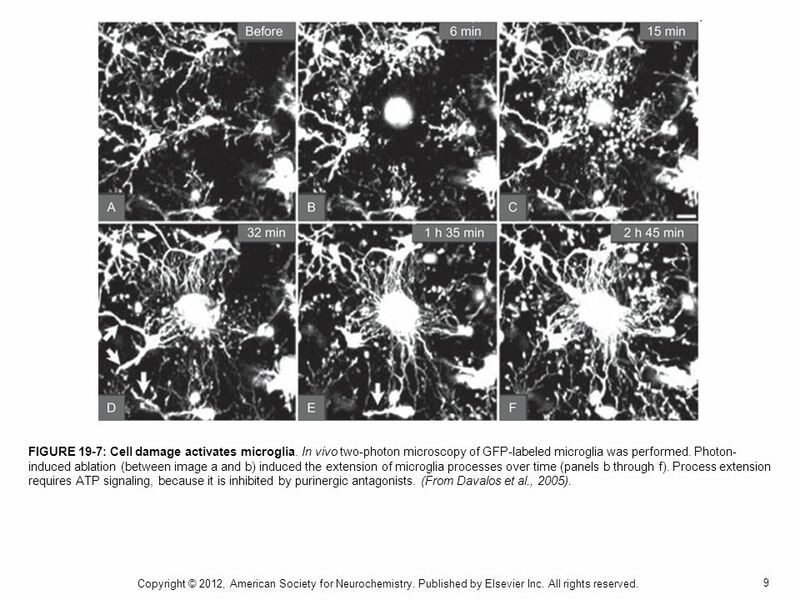 Photon- induced ablation (between image a and b) induced the extension of microglia processes over time (panels b through f). Process extension requires ATP signaling, because it is inhibited by purinergic antagonists. (From Davalos et al., 2005). Copyright © 2012, American Society for Neurochemistry. Published by Elsevier Inc. All rights reserved. 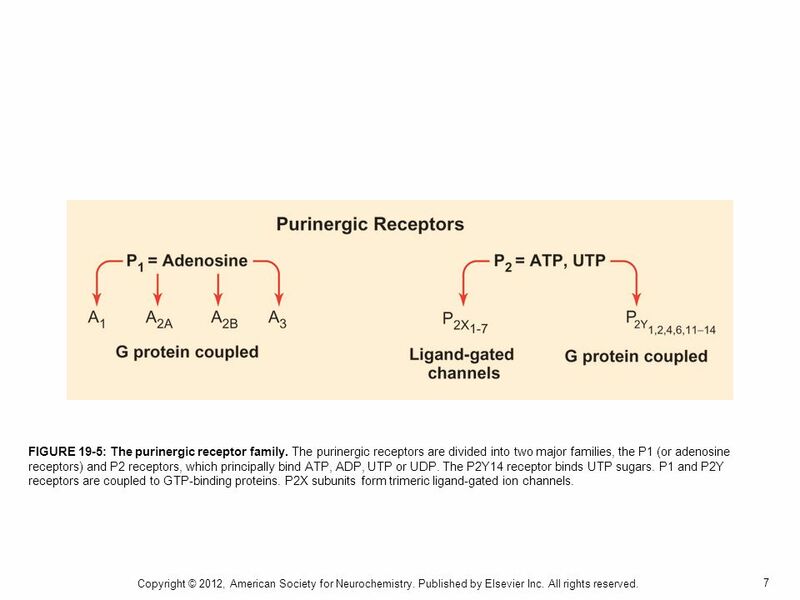 Download ppt "1 Chapter 19 Purinergic Signaling Copyright © 2012, American Society for Neurochemistry. Published by Elsevier Inc. All rights reserved." CELL TO CELL COMMUNICATION Part 2. Transduction: Cascades relay signals Signal transduction involves multiple steps Multistep pathways can amplify a signal. CONCEPT 5.6: The plasma membrane plays a key role in most cell signaling In multicellular organisms, cell-to-cell communication allows the cells of the. Receptors & Signaling. Assumed Knowledge Structure of membrane proteins Ion concentrations across membranes Second messengers in signal transduction Regulation. Copyright © 2005 Pearson Education, Inc. publishing as Benjamin Cummings Which atom has a stronger affinity for its electrons - Carbon or Oxygen? How do.